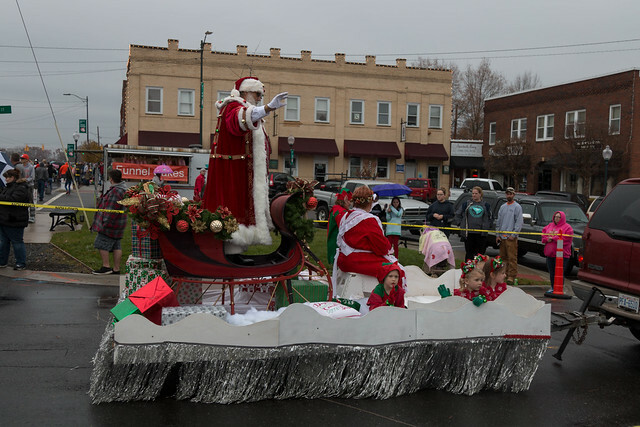 While the iffy weather kept the crowds just a little smaller than usual for the Mocksville Christmas Parade, the event was a blast for everyone who came out to join the fun. Come on out and join the fun as the Christmas traditions continue in Davie County with pipes and drums, a holiday crawl, downtown hayrides, a movie on the park and Christmas tunes by the Davie Community Band. The schedule of holiday events for is listed below the parade photos! A special thank you to Ed Simmons Photography for the wonderful parade photos. Piedmont Firefighters Pipes and Drums – Friday, December 7, 6 p.m. to 7:30 p.m.
Advance Christmas Parade – Saturday, December 8, 10 a.m. to 11 a.m.
Free event – Advance Christmas parade presented by the Advance Fire Department. Grab a cup of hot chocolate and enjoy the festivities. All parade participants must line up before 9 a.m. Floats and trailers will meet in the LeBleu parking lot located at 3134 Cornatzer Rd., Advance, NC 27006. All classic cars, fire trucks, motorcycles, horses and other parade participants will meet in the parking lot of Shady Grove Elementary School located at 3179 Cornatzer Rd, Advance, NC 27006. The parade begins at 10 a.m. at the school and follows Cornatzer Road, turning right onto Highway 801 and left on Peoples Creek Road. Registration is FREE and can be done on-site at arrival. “What Christmas Is All About” is an annual event hosted by the Advance Fire Department. Volunteers gather to prepare and deliver gifts to shut-ins, families experiencing sickness or loss, or someone who just needs an extra dose of cheer for Christmas. Holiday Crawl – Saturday, December 8, 12 p.m. to 4 p.m.
Free event. The Holiday Crawl will take place in downtown Mocksville on Saturday, December 8th from Noon – 4 p.m. Each retail merchant will have a space set up for children to make a simple and free gift for a parent. Frosty Fun Movie in the Park – Friday, December 14, 6 p.m. to 8 p.m.
Free event. Come enjoy the film Home Alone (rated PG), at Main Street Park for FREE. Wear your warm pajamas and bring a sleeping bag or warm blanket to stay warm. There will be heaters and of course, hot chocolate. And best of all, they will have a snow machine working that festive night! READasaurus Rocks at the Brock – Saturday, December 15, 11 a.m. to 11:45 a.m.
Free event. READasaurus Rocks, with Mark Daniel, sets the audience’s imagination on full power incorporating puppetry, storytelling, magic tricks, and audience participation. Enjoy the retelling of CHICA CHICA BOOM BOOM, CHARLOTTE’S WEB, and more. In celebration of the holidays, Mark closes with his signature piece, based on THE POLAR EXPRESS. A Day with Santa & Mrs. Claus – Saturday, December 15, 2 p.m. to 5 p.m.
Free event. Spend the day with Santa & Mrs. Claus at Sadie’s Shoppe in downtown Mocksville! Bring your letters to Santa and visit a live nativity set and feed the reindeer! Downtown Hayrides – Saturday, December 15, 6 p.m. to 8 p.m.
Free event. Come out to downtown Mocksville for a hayride and enjoy the festive Christmas holiday lights and atmosphere. While downtown, enjoy an ice cream or hot cocoa or a dinner at our local restaurants after the ride. Merchants will be OPEN for your holiday gifts. Bring a blanket to stay WARM. This event is Free and will start at 185 N. Main St., Sadie’s Shoppe on the Corner! Davie Community Band & Christmas Tunes – Saturday, December 15, 6:30 p.m. to 7:30 p.m.
Free event. Come out and enjoy your favorite Christmas tunes at the Main Street Park in downtown Mocksville as performed by your Davie Community Band. For more information about the Piedmont Firefighters Pipes and Drums, the holiday crawl, the horse and buggy rides, movie in the park, or downtown hayrides contact Tami Langdon at the Mocksville Tourism Development Authority, (336) 753-6705.